I’ve not been out to The Rowbarge since their fine, inaugural gin festival last Summer so I’ve been looking for a good excuse to get out there to see what their relentlessly growing, yet carefully curated, gin range has to offer. The pub is prominently situated on The River Kennet between Reading and Newbury, and when the weather is good it’s a lovely cycle out from Reading along the river. When the weather isn’t so good it’s only about 200 meters from Midgham railway station and there is also a good-sized car park so, whatever your chosen mode of transport, they really couldn’t make it much easier for you. On the day in question it had been raining for about 2 months, or so it seemed, so I reasoned the riverside route may be a little muddy so opted to let the train take the strain and, no more than 15 minutes after leaving Reading station, I enter the pub. It has a fine reputation for food and drink and if you look on their website, as well as a gin menu, you will see the Daily Food Menu and others covering ‘Elevenses’, ‘Sunday Roasts’, ‘BBQ’, ‘Beer’, ‘Whisky’ and ‘Wine’ so I think we can say they’ve got it all covered but, as always, it is my Mistress, gin, that draws me back. This time the temptation was in the somewhat irregular shape of experimental local distillery, Twisting Spirits*, who were there to present their innovative range to an expectant group of about twenty ginthusiasts. I have already posted a detailed account of the tasting and my thoughts on these most innovative gins in Twisting My Sobriety – A Gin Devil review, so I won’t go into further detail here but, even if you don’t want to read the full story, I would urge you to give them a try if you are fortunate enough to encounter them. Richard, of Twisting Spirits, struggles through the juniper-crazed hordes at The Rowbarge. So, freshly ginned-up, it would be a little remiss of me if I didn’t take the opportunity to have a little look at how their gin menu was shaping up. The list now tops 80, but I’m less interested in the quantity, than the quality; A good menu should make sure there’s something for everyone from the pre-dinner G&Ter to the hard-core gin geek and now, with hundreds of distilleries in the UK, I’m always looking for a good selection of local gins to add a sense of place. This menu is, helpfully, divided into ‘Traditional’, ‘Spicey’, ‘Citrusy, Delicate & Floral’, ‘Not Your Average Gins’, ‘Sweet & Fruity’, ‘Herbaceous’, ‘Dry, Crisp & Powerful’ and ‘Sloe’ categories so no arguments with the flavour range on offer. Within each there’s a good mix of the tried and trusted, to keep the more conservative drinker happy: the likes of Hendricks, Sipsmiths and Martin Miller, and some quality up-and-coming gins, such as Salcombe and Anno Dry, if you’re ready to take the next step. There is also, and this is very much to their credit, a larger than expected selection of suspicious characters, hanging around in the shadows, hoping someone strays so they can strike! This includes the McQueens’ range (Spiced Chocolate Mint, anyone), Zymurgorium (Turkish Delight) and the Dutch Black Tomato Gin (yes, really!). On the local front they also do excellently with a long-standing favourite of mine: Twisted Nose, The Cotswolds Distillery range (that Cotswolds 1616 ‘Genever’ is an absolute belter), Ramsbury, Griffiths Brothers and now, of course, the full range from Twisting Spirits. The most notable absentee is Mr. Hobbs Henley Gin which, given the thoroughness of the rest of the list, may just be a distribution thing. I’d also recommend they check out the distinctive grain-to-glass range from TOAD, in Oxford and Wayfinder, in Beaconsfield. So quite a selection, but what to choose and, following that taste bud stimulating journey with the Twisting Spirits it was either run for safety or up the ante and I doubled down and opted for the latter. The Inverroche range, from South Africa, stood out as I’d never tried any of their output before and the description of the Amber Gin was simply too intriguing: “Rounded, woodsy spice character alongside the expected Cape florals with touches of tobacco leaf and nutty complexity”. Now, if you’re thinking that doesn’t sound much like a gin, you’d not be wrong: The aroma was heady, floral and intoxicating, there was medicinal, herbal flavours, some spice and warm orange citrus, all underpinned by a deep, rooty earthiness and yes, the tobacco is definitely there at the end. The botanicals are hyper-local so impossible for me to pin down beyond that. It’s Gin, Captain, but not as we know it! While one could argue that Twisting Spirits had stepped over the line a little with their disregard for the primacy of juniper within the gin flavour-profile, these guys act like there never was a line. The juniper does arrive, but it’s so late to the party everyone else has already ordered an Uber, consequently it struggles to make much of an impression and in the morning you probably won’t even remember it. I’ve no idea how to categorise or rate this. It’s easy drinking nature makes it more like drinking a light, fruity whiskey, or maybe genever, cocktail than anything else I can think of. Check it out, see what you think and keep repeating the word “Gin” in your head until the juniper arrives. I admit that I thoroughly enjoyed sipping my way through its complexities and would recommend it as a drink, but if the label hadn’t said ‘Gin’ I would have struggled to pick it as one. 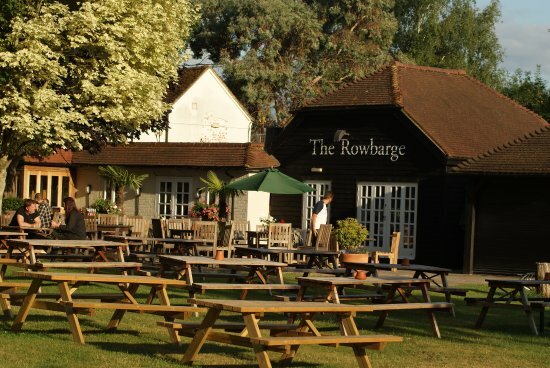 So The Rowbarge gives you quality food & drink in abundance and, come the Summer, the extensive outside seating area really comes in to its own for both dining and just sitting and supping while watching the river, and the world, roll on by. If all the food and drink isn’t enough to tempt you over, and quite frankly I can’t think of a single reason why it wouldn’t be, the pub is a good base for walking and hosts open air theatre in the Summer. Check out the events page of the website for details of this and all forthcoming events, including their second Summer Gin Festival on August 17th. *Not to be confused with the Twisted Nose spirits from The Winchester Distillery. Nice review. Enjoyed reading it. I interviewed Lorna Scott a couple of months ago. Inspirational lady.